Alison became a lecturer in the Division of Optometry and Visual Science at City University London in July 2013. Her specialism is the early detection and treatment of Age-Related Macular Degeneration. Alison gained a degree in Optometry and Vision Sciences at Cardiff University in 1998. After passing Professional Qualifying Examinations, and working for several years as an Optometrist, she returned to Cardiff University to obtain a PhD investigating the electrophysiological characteristics of early age-related macular degeneration (AMD), and continued to work in the School of Optometry and Vision Sciences from 2004-2013. For the past 13 years, Alison has been carrying out research into the most sensitive clinical tools for the diagnosis and monitoring of AMD and, more recently, into treatments for early AMD. 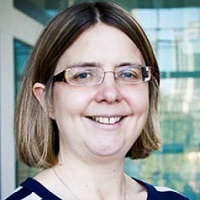 In July 2013, Alison became a lecturer in the Division of Optometry and Visual Science in City University London, where she continues to carry out both research and teaching roles. Alison's principal research interest is age-related macular degeneration (AMD). Approximately 500,000 people in the UK have advanced AMD, and it is responsible for more than half of all registrations as sight impaired or severely sight impaired. Her research is targeted at the early stage of AMD, aiming to develop treatments to prevent progression to the sight-threatening form of the disease, and to identify sensitive biomarkers. Alison is also interested in the evaluation of low vision service provision for people with visual impairment, and has conducted two significant systematic reviews in the field. A further area of research interest is the evaluation of retinal adaptation using electrophysiology, psychophysics and imaging techniques. She considers this to be an important area of research, given the sensitivity of measures of retinal adaptation to early stages of retinal disease, including AMD. AMD light trial (ALIGHT): an exploratory phase I/IIa clinical trial investigating the effect of low level illumination at night on the progression of AMD. Oxygen consumption of the retina is reduced by exposing the eye to low illumination during sleep, thus minimising retinal hypoxia. This is a collaboration with Cardiff University (Dr Tom Margrain), Bristol Eye Hospital (Miss Clare Bailey), and Polyphotonix Medical Ltd. Funded by the College of Optometrists. Development of retinal imaging densitometer: The design, development and evaluation of a new retinal imaging densitometer in a collaborative project with Cardiff University and the UK Astronomy and Technology Centre (UKATC). The densitometer measures reflectance of light from the retina to objectively evaluate the recovery of photopigment after exposure to a bright adapting light. The collaboration with UKATC permits the use of 'cutting edge' astronomical imaging technology to generate, for the first time, a topographical map of photopigment regeneration. This project is funded by the NIHR I4I scheme. Evaluation of functional biomarkers for the early detection and monitoring of autosomal dominant optic atrophy: in collaboration with Professor Marcela Votruba and Dr Tom Margrain at Cardiff University. Investigation of the effect of hypoxia on retinal function in AMD: Literature suggests that lack of oxygen at the outer retina may be responsible for the functional deficits seen in AMD. However, this hypothesis has never been directly evaluated. The effect of inhalation of supplementary oxygen on a range of visual functions will be investigated, as will the effect of background light level on hypoxia in AMD. This project is supported by the Cardiff University Endowment Scholarship. Alison has also received grant funding from the Macular Society and the RNIB. Taylor, D.J., Jones, P.R., Smith, N.D., Binns, A.M. and Crabb, D.P. (2018). Measuring real-time anxiety during simulated mobility scenarios in people with non-neovascular age-related macular degeneration (AMD). Hobby, A.E., Huntjens, B., Mahroo, O.A.R., Crabb, D.P. and Binns, A.M. (2018). Association between number of injections during long-term anti VEGF therapy and retinal electrophysiological parameters. Margrain, T., Todd, S., Binns, A.M., Gaffney, A., Fergusson, J., Henry, D. … Wood, A. (2018). Functional imaging of the retinal pigment epithelium using high fidelity retinal densitometry. Hobby, A.E., Kozareva, D., Yonova, E.H., Hossain, I.T., Katta, M., Huntjens, B. … Mahroo, O.A.R. (2016). Effect of varying skin surface electrode position on electroretinogram responses recorded using a handheld stimulating and recording system. 2016 ARVO Annual meeting 1-5 May, Seattle, Washington. Callaghan, T., Binns, A. and Margrain, T. (2016). Functional biomarkers of hypoxia in Age-related macular degeneration. Taylor, D.J., Smith, N., Binns, A. and Crabb, D. (2016). Searching for objects in everyday scenes and recognising faces: measuring performance in people with dry age-related macular degeneration (AMD). Binns, A.M. and Margrain, T.H. (2003). The ERG photostress test. Annual Meeting of the Association-for-Research-in-Vision-and-Ophthalmology May, FT LAUDERDALE, FLORIDA. Robinson, D.G., Margrain, T.H., Bailey, C. and Binns, A.M. (2019). An Evaluation of a Battery of Functional and Structural Tests as Predictors of Likely Risk of Progression of Age-Related Macular Degeneration. Investigative Opthalmology & Visual Science, 60(2), pp. 580–580. doi:10.1167/iovs.18-25092 . Finger, R.P., Schmitz-Valckenberg, S., Schmid, M., Rubin, G.S., Dunbar, H., Tufail, A. … Holz, F.G. (2019). MACUSTAR: Development and clinical validation of functional, structural, and patient-reported endpoints in intermediate age-related macular degeneration. Ophthalmologica, 241(2), pp. 61–72. doi:10.1159/000491402 . Robinson, D.G., Margrain, T.H., Dunn, M.J., Bailey, C. and Binns, A.M. (2018). Low-level nighttime light therapy for age-related macular degeneration: A randomized clinical trial. Investigative Ophthalmology and Visual Science, 59(11), pp. 4531–4541. doi:10.1167/iovs.18-24284 . Taylor, D.J., Smith, N.D., Binns, A.M. and Crabb, D.P. (2018). The effect of non-neovascular age-related macular degeneration on face recognition performance. Graefe's archive for clinical and experimental ophthalmology = Albrecht von Graefes Archiv fur klinische und experimentelle Ophthalmologie, 256(4), pp. 815–821. doi:10.1007/s00417-017-3879-3 . Binns, A.M., Taylor, D.J., Edwards, L.A. and Crabb, D.P. (2018). Determining Optimal Test Parameters for Assessing Dark Adaptation in People With Intermediate Age-Related Macular Degeneration. Investigative ophthalmology & visual science, 59(4). doi:10.1167/iovs.18-24211 . Bott, D., Huntjens, B. and Binns, A. (2018). Nutritional and smoking advice recalled by patients attending a UK age-related macular degeneration clinic. Journal of Public Health (United Kingdom), 40(3), pp. 614–622. doi:10.1093/pubmed/fdx115 . Taylor, D.J., Edwards, L.A., Binns, A.M. and Crabb, D.P. (2017). Seeing it differently: self-reported description of vision loss in dry age-related macular degeneration. Ophthalmic & physiological optics : the journal of the British College of Ophthalmic Opticians (Optometrists), 38(1). doi:10.1111/opo.12419 . Binns, A. (2016). Effect of a Home Visit–Based Low Vision Rehabilitation Intervention on Visual Function Outcomes. Investigative Opthalmology & Visual Science, 57(15), pp. 6668–6668. doi:10.1167/iovs.16-21126 . Hobby, A.E., Kozareva, D., Yonova-Doing, E., Hossain, I.T., Katta, M., Huntjens, B. … Mahroo, O.A. (2016). Effect of varying skin surface electrode position on electroretinogram responses recorded using a handheld stimulating and recording system. Documenta Ophthalmologica. doi:10.1007/s10633-018-9652-z . Acton, J.H., Molik, B., Binns, A., Court, H. and Margrain, T.H. (2016). Effect of rehabilitation worker input on visual function outcomes in individuals with low vision: Study protocol for a randomised controlled trial. Trials, 17(1). doi:10.1186/s13063-016-1235-2 . Morny, E.K.A., Margrain, T.H., Binns, A.M. and Votruba, M. (2015). Electrophysiological ON and OFF responses in autosomal dominant optic atrophy. Investigative Ophthalmology and Visual Science, 56(13), pp. 7629–7637. doi:10.1167/iovs.15-17951 . McKeague, C., Margrain, T.H., Bailey, C. and Binns, A.M. (2014). Low-level night-time light therapy for age-related macular degeneration (ALight): !tudy protocol for a randomized controlled trial. Trials, 15(1). doi:10.1186/1745-6215-15-246 . Gispets, J., Cardona, G., Tomàs, N., Fusté, C., Binns, A. and Fortes, M.A. (2014). A New Slit Lamp–Based Technique for Anterior Chamber Angle Estimation. Optometry and Vision Science, 91(6), pp. 668–675. doi:10.1097/opx.0000000000000254 . Wood, A., Margrain, T. and Binns, A.M. (2014). Detection of early age-related macular degeneration using novel functional parameters of the focal cone electroretinogram. PLoS ONE, 9(5). doi:10.1371/journal.pone.0096742 . Gaffney, A.J., Binns, A.M. and Margrain, T.H. (2014). Measurement of cone dark adaptation: a comparison of four psychophysical methods. Doc Ophthalmol, 128(1), pp. 33–41. doi:10.1007/s10633-013-9418-6 . Gaffney, A.J., Margrain, T.H., Bunce, C.V. and Binns, A.M. (2014). How effective is eccentric viewing training? A systematic literature review. Ophthalmic and Physiological Optics, 34(4), pp. 427–437. doi:10.1111/opo.12132 . McKeague, C., Binns, A.M. and Margrain, T.H. (2014). An evaluation of two candidate functional biomarkers for AMD. Optometry and Vision Science, 91(8), pp. 916–924. doi:10.1097/OPX.0000000000000318 . Gaffney, A.J., Binns, A.M. and Margrain, T.H. (2013). The effect of pre-adapting light intensity on dark adaptation in early age-related macular degeneration. Doc Ophthalmol, 127(3), pp. 191–199. doi:10.1007/s10633-013-9400-3 . Gaffney, A.J., Binns, A.M. and Margrain, T.H. (2013). The effect of pre-adapting light intensity on dark adaptation in early age-related macular degeneration. Documenta Ophthalmologica, 127(3), pp. 191–199. doi:10.1007/s10633-013-9400-3 . Gaffney, A.J., Binns, A.M. and Margrain, T.H. (2012). Aging and cone dark adaptation. Optom Vis Sci, 89(8), pp. 1219–1224. doi:10.1097/OPX.0b013e318263c6b1 . Binns, A.M., Bunce, C., Dickinson, C., Harper, R., Tudor-Edwards, R., Woodhouse, M. … Margrain, T.H. (2012). How effective is low vision service provision? A systematic review. Survey of Ophthalmology, 57(1), pp. 34–65. doi:10.1016/j.survophthal.2011.06.006 . Wood, A., Margrain, T. and Binns, A. (2011). The effect of bleach duration and age on the ERG photostress test. Graefe's Archive for Clinical and Experimental Ophthalmology, 249(9), pp. 1359–1365. doi:10.1007/s00417-011-1627-7 . Gaffney, A.J., Binns, A.M. and Margrain, T.H. (2011). Topography of cone dark adaptation deficits in age-related maculopathy. Optom Vis Sci, 88(9), pp. 1080–1087. doi:10.1097/OPX.0b013e3182223697 . Gaffney, A.J., Binns, A.M. and Margrain, T.H. (2011). The repeatability of the Goldmann-Weekers adaptometer for measuring cone adaptation. Doc Ophthalmol, 122(2), pp. 71–75. doi:10.1007/s10633-011-9261-6 . Binns, A.M., Mortlock, K.E. and North, R.V. (2011). The relationship between stimulus intensity and response amplitude for the photopic negative response of the flash electroretinogram. Doc Ophthalmol, 122(1), pp. 39–52. doi:10.1007/s10633-010-9257-7 . Wood, A., Binns, A., Margrain, T., Drexler, W., Povaay, B., Esmaeelpour, M. … Sheen, N. (2011). Retinal and choroidal thickness in early age-related macular degeneration. American Journal of Ophthalmology, 152(6). doi:10.1016/j.ajo.2011.05.021 . Dickinson, C., Linck, P., Tudor-Edwards, R., Binns, A., Bunce, C., Harper, R. … Margrain, T. (2011). A profile of low vision services in England: The low vision service model evaluation (LOVSME) project. Eye, 25(7), pp. 829–831. doi:10.1038/eye.2011.112 . Mortlock, K.E., Binns, A.M., Aldebasi, Y.H. and North, R.V. (2010). Inter-subject, inter-ocular and inter-session repeatability of the photopic negative response of the electroretinogram recorded using DTL and skin electrodes. Documenta Ophthalmologica, 121(2), pp. 123–134. doi:10.1007/s10633-010-9239-9 . Tumlinson, A.R., Hermann, B., Hofer, B., Povazay, B., Margrain, T.H., Binns, A.M. … Drexler, W. (2009). Techniques for extraction of depth-resolved in vivo human retinal intrinsic optical signals with optical coherence tomography. Jpn J Ophthalmol, 53(4), pp. 315–326. doi:10.1007/s10384-009-0684-5 . Hermann, B., Torti, C., Fernández, E.J., Ahnelt, P., Považay, B., Hofer, B. … Drexler, W. (2008). Towards in vivo imaging of photoreceptor morphology and function. Biomedical Optics, BIOMED 2008. Binns, A.M. and Margrain, T.H. (2007). Evaluating retinal function in age-related maculopathy with the ERG photostress test. Invest Ophthalmol Vis Sci, 48(6), pp. 2806–2813. doi:10.1167/iovs.06-0392 . Binns, A. and Margrain, T.H. (2006). Development of a technique for recording the focal rod ERG. Ophthalmic Physiol Opt, 26(1), pp. 71–79. doi:10.1111/j.1475-1313.2005.00355.x . Binns, A. and Margrain, T.H. (2005). Evaluation of retinal function using the Dynamic Focal Cone ERG. Ophthalmic Physiol Opt, 25(6), pp. 492–500. doi:10.1111/j.1475-1313.2005.00338.x . European Low Vision Conference. Oxford University (2013). Macular Society Top Doctors Conference (Invited Speaker). (2013).